This family recipe is uncomplicated and absolutely delicious. For the first five years of my life, we lived in the apartment next door to my grandparents. I may have only been a toddler, but I still have vivid memories of being in that home with its many house plants overflowing in their pots, tchotchkes and art from the former Soviet Union, menorahs and other Jewish objects on display, and a welcoming coziness and warmth. What I remember most about being at my grandparents’ home was the food. Often, there was a pot of something simmering on the stove. On the best days, that pot was filled with tefteli, otherwise known as Russian meatballs. I can still see myself sitting at my grandmother’s table in front of a steaming bowl of tefteli, eagerly waiting for them to cool down so I could start eating. What makes Russian meatballs different from other kinds? While tefteli come in all types of variations and preparations depending on your own family’s tradition, one of their defining features is that they’re typically made with rice. It’s likely that rice was first incorporated into the dish as a means to stretch the meat, but it also adds a great texture and flavor. Unlike the Italian kind, most Russian meatballs don’t use breadcrumbs, or much by way of herbs or spice. Some folks make them with beef, some with chicken or turkey. The non-kosher versions are often made with pork, and are cooked in a creamy tomato sauce. Some cooks dust the meatballs in flour and then brown them before adding them to the sauce. Some bake them in the oven. Some make a sauce that ends up so thick it is almost shakshuka-like. Usually, shredded carrot is added to the base of the tomato sauce, adding sweetness. Tefteli are also meant to be eaten on their own as a main course, and they are frequently served with creamy mashed potatoes, but I also love them with a side of polenta, or even with just a slice of good crusty bread. Every time I make tefteli I try to replicate what my grandmother made for me. Yes, I’m biased, but her meatballs are the best I’ve ever tried. This recipe is fairly simple in terms of its ingredients and steps, but the key to her tefteli’s success is one step that you can’t rush or skip: caramelizing the onions. Caramelizing onions was my grandmother’s go-to flavor builder. When onions get golden and jammy from cooking slowly in a little fat, they add sweetness and umami to any dish. The rest of this recipe mainly involves adding things to a large pot. Leftover rice is great for the meatball mixture, but if you don’t have some on hand, I find the timing works out well if you cook the rice while you’re caramelizing the onions and making the sauce. I prefer to use dark meat ground chicken for this, but you can definitely make this with turkey or beef. This is the kind of dish that rarely gets a written recipe. I’ve given you specifics, but deviating from what is suggested will only make this better. Taste and modify your tefteli and sauce to your own liking. For instance, my mom actually dislikes rice in her meatballs, so she adds breadcrumbs or matzah meal instead. I like to add chili flake for subtle heat, but that can be completely omitted. I find that these are perfect when they’re on the larger-side, but if you like smaller-sized meatballs go for that. In any form, these are best made in a big batch so that they can be shared with loved ones, and so that they can fill your home with warmth and the smell of good simple food. 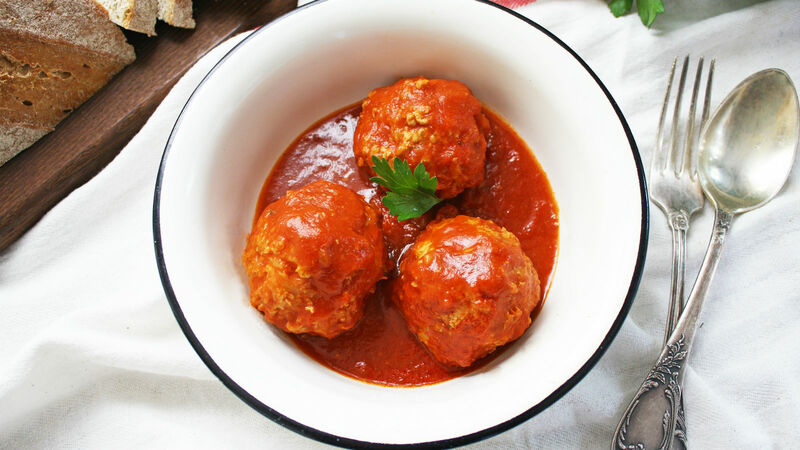 I suggest serving these meatballs with a generous ladle of sauce, topped with chopped fresh parsley alongside mashed potatoes, your favorite side, or slices of good bread. Note: Meatballs can be made several days in advance, and they freeze and reheat well. To make the sauce: Add oil to a Dutch oven or large heavy-bottomed pot over medium heat. Add the diced onion to the pot. Allow the onion to soften and caramelize until golden, stirring occasionally, about 15-20 minutes (you can go for longer if you want the onion to caramelize more deeply). Add grated carrot, minced garlic, and a big pinch of salt to the pot. Stir and sauté for 3-4 minutes, or until the carrot has softened and the garlic is aromatic. Add the tomato paste and stir until everything is coated, about 1 minute. Add the crushed tomato, tomato sauce, maple syrup, herbs and chili flake to the pot. Fill the empty 28 oz crushed tomato can with water and add that water to the pot. Taste and season with salt and pepper. Let the mixture come up to a simmer. 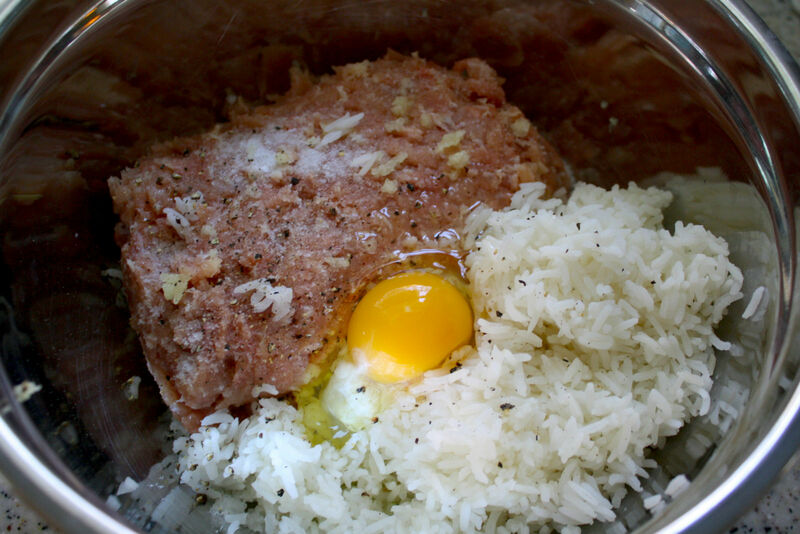 To make the meatballs: In a large bowl, combine the ground chicken, cooked rice, and onion. I like to use a microplane to grate my garlic straight into the bowl. Add the salt, pepper, and egg. Combine everything together until well incorporated, but make sure not to overmix or the meat can become tough. Clean hands work best for this. Before I cook the meatballs, I like to take a spoonful of the mixture and cook it in a small pan to taste for seasoning. I add more salt or pepper accordingly. 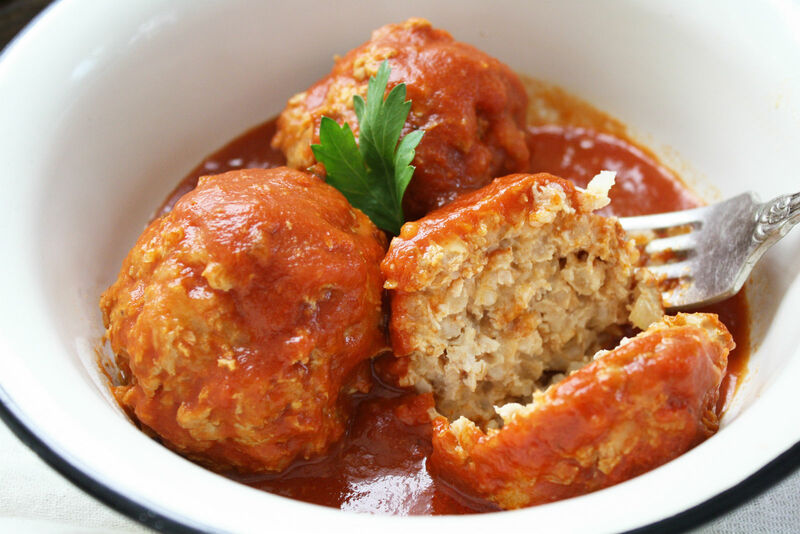 Form the ground meat mixture into even-sized balls. I prefer my tefteli slightly larger than a golf ball, but make them according to your own preferences. 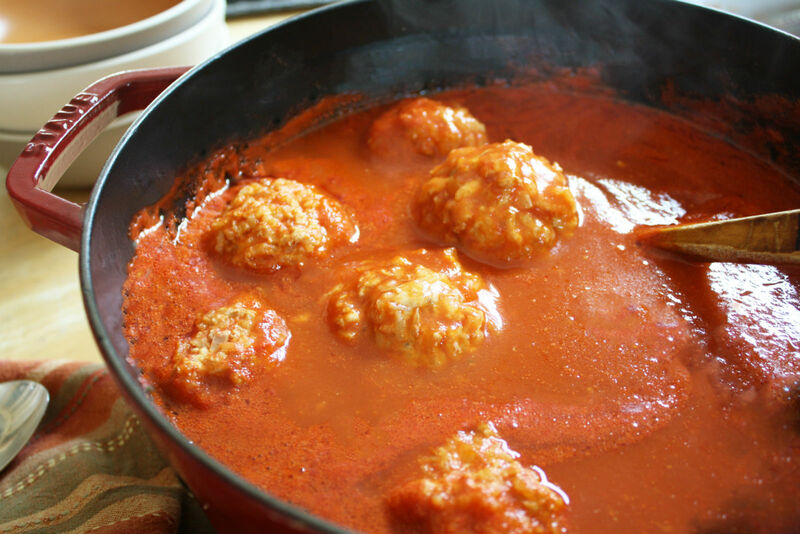 Drop the formed meatballs into the simmering sauce. Make sure the sauce returns to a simmer, then lower the heat and partially cover the pot with a lid. Simmer the meatballs for 35-45 minutes or until cooked through. If you find the sauce is too thick you can add more water. If you want the sauce less thick, you can simmer it for longer to reduce and thicken.